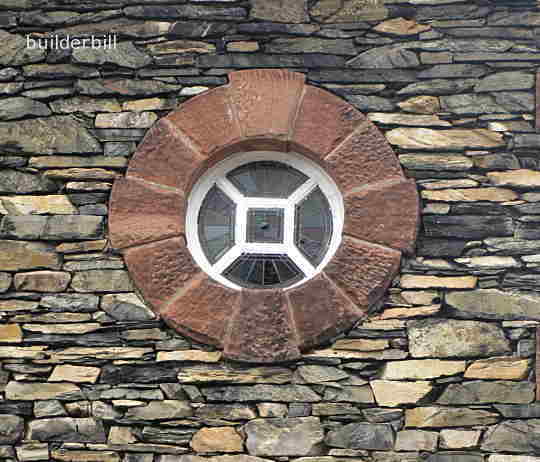 A type slate or sedmentary stone, and the stonework and stone walling that it produces. Particular to the English Lake District. The English Lake district is one of my favourite spots on earth. Living on the opposite side of the world makes it hard for me to visit it often but I do have quite a few photographs and here are a few that I am fitting into this web glossary probably more for my benefit than my reader's. I like the window above, it has style and while only letting in a small amount of light it is obviously is an external and internal feature.Note the extended keystone effect at the cardinal points. For a couple of hundred years or so the Lake District quarried slate and it was used all over the North of England as a roofing material. At the same time the slate quarries must have produce huge quantities of stone that while it was not suitable for roofing, with a bit of invention it could be trned into a viable wall building material. The predominant style was dry walling, that is building without mortar. This way of working requires a great deal of skill and the age of some of the buildings in the Lakes is a testament to the fine stone workers that built them. This style of masonry work lends itself to getting the absolute most out of the material at hand and saving labour. Squared ashlar lintels take a lot of effort to make. Stones that would be rejected for ashlars can often be used. I should rephrase that actually, not only lintels, but almost every stone used in this style of stonework would be discarded for ashlar work. 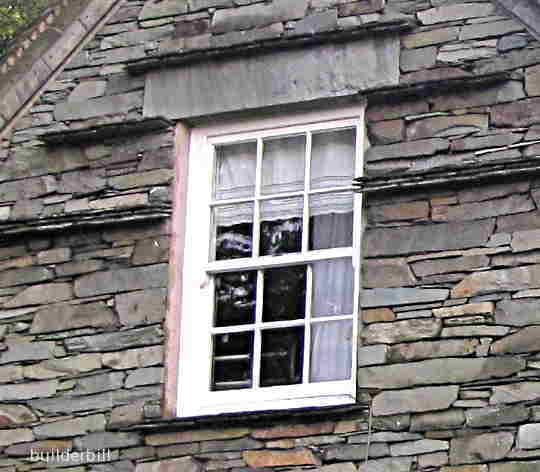 An unusual use of roofing slate to create drip edges around a window. 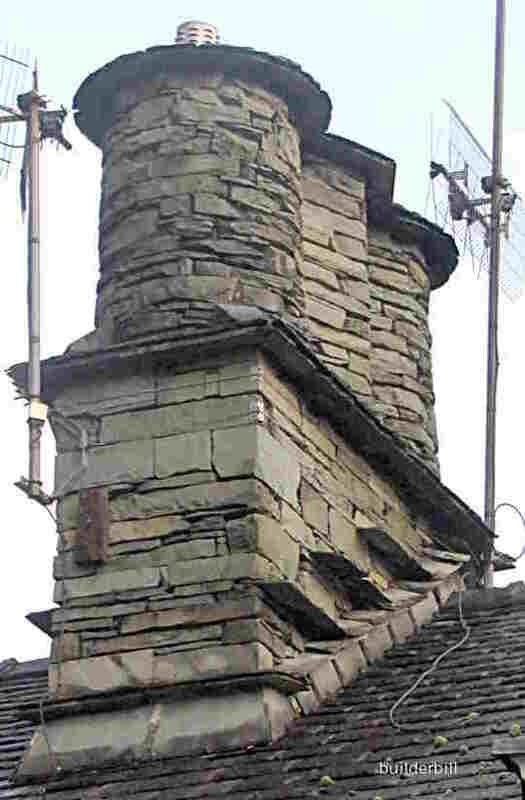 The same house as the previous photo again uses the drip edges around the chimney stack. I like the ease that the mason handles his material, round or not, it's all the same. 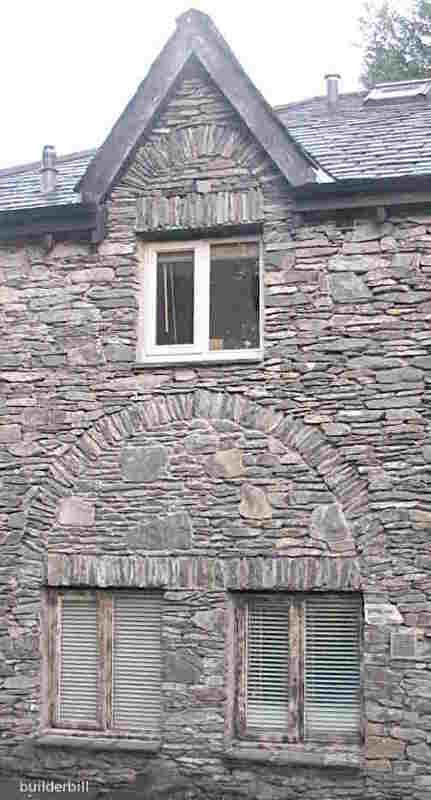 The builder of this lakeland stone house chose not to use solid lintels but used this unusual method of building relieving arches to spread the load. Once again some craftsman showing off a touch and making it look easy.